Valentine’s Day has rolled right up to our doorstep and like many I am freaking out about what to give my partner. Sure there are all the old faithfuls like jewelry, chocolate, wine and a bouquet of flowers but I want to give her something meaningful and non cliche and I thought of something perfect; a pot plant! Sure you might think, “that’s messy and boring, give me the wine and jewelry” but I am not intending to sweep her off her feet with this gift (I did that long ago). If I wanted to get all smooshy about the meaning behind the gift, it would be that it’s real, alive and long lasting and if nurtured will give us years and years of beauty, whereas a bouquet of flowers will shrivel up and die. Yes, great, let’s give someone a gift that is beautiful for a few days then dies, is that a metaphor for our relationship? Not mine. If we nurture our relationship then it will last a lifetime, hence the pot plant. Now you’re probably visualising a morbid little plant that’s all droopy and sad but that’s not the case. 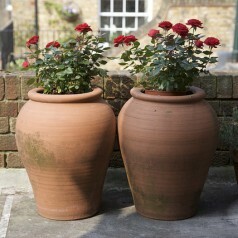 I intend to get an entire rose bush and plant it in a huge, fancy terracotta pot. Not only do terracotta pots look good but using plastic pots is uncool to the environment. Here are some other ways to be good to the environment with your pot plants. How romantic is that! Eco-friendliness/thoughtfulness/practicality all rolled into one perfect Valentine’s gift. This article was written by Joe McCord, an online marketing specialist who works for Matter Solutions. Matter Solutions specialise in SEO, PPC, web design and online marketing and are located in Brisbane, Australia. Joe likes fishing. Take him fishing.